Being named team captain is often an honor bestowed upon seniors. 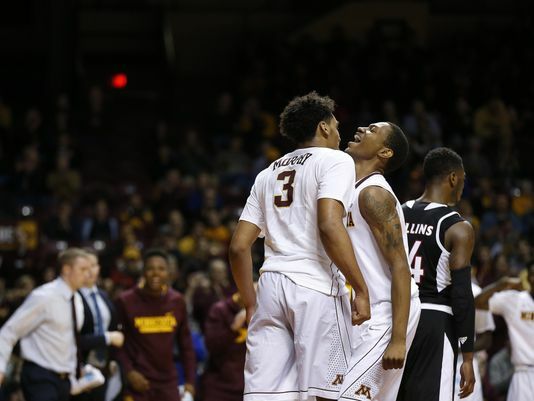 Still, the Gophers men’s basketball team never had a pair of four-year players as captains under Richard Pitino. Not until Jordan Murphy and Dupree McBrayer were selected team captains Wednesday. Murphy and McBrayer both started their U career on an eight-win team in 2015-16. They were major contributors to an NCAA tournament team as sophomores, and saw the program rise and fall after injuries and off-court issues last season as juniors. They’ve grown through the highs and lows and can pass down advice to their younger teammates this season. McBrayer looks forward to embracing the role graduated senior Nate Mason had the last two seasons as a veteran presence on the perimeter. McBrayer and junior Amir Coffey are surrounded by youth in the backcourt with sophomores Isaiah Washington, Marcus Carr and Payton Willis and freshman Gabe Kalscheur. Murphy is mentoring freshmen Daniel Oturu and Jarvis Omersa to prepare them for the Big Ten grind. And don’t be surprised to see him leading by example and playing with a chip on his shoulder this season. On Thursday, the 6-foot-7 two-time All-Big Ten forward was named to the preseason watch list for the Karl Malone Award, given to the nation’s top power forward. That was one of the few preseason lists (CBSSports.com recently ranked Murphy 39th and Coffey 82nd among top 100 college hoops players) that recognized how well he played last season with averages of 16.8 points and 11.3 rebounds and a NCAA-best 24 double-doubles.